Yes, it is possible to change the product folder for PhotogeoDWG. You have to do this after you run the Exchange Apps Store msi package, but it’s really easy. As you can see there isn’t a way to change the install folder before you click “Install Now”. But, you can change the location after install. If you are using PhotogeoDWG with AutoCAD2013 the plugin will autoload if it resides in the Roaming\Autodesk folder, the Program Files\Autodesk folder, or the ProgramData\Autodesk folder. The msi package will install the to the Roaming\Autodesk\ApplicationPlugins\CMRI_Photogeo.bundle folder. But, if you want all users to be able to have access to this plugin without having to install it a bunch of times, then just move the Roaming\Autodesk\ApplicationPlugins\CMRI_Photogeo.bundle to Program Files\Autodesk\ApplicationPlugins\CMRI_Photogeo.bundle. That’s all you have to do. AutoCAD will take care of the rest. I just finished up some testing running PhotogeoDWG in AutoCAD 2013 on Windows XP (SP3) and the results are good. 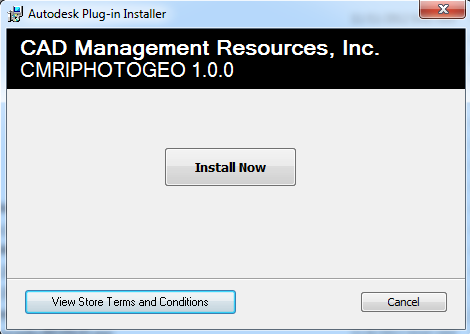 The Autodesk Exchange Apps Store installer copies the Photogeo bundle into %appdata%, as it does in Windows 7. But in XP, the AppData location is in the Documents and Settings Application Data folder of the current user, and not in the user’s roaming folder. Autoloader worked great in AutoCAD 2013 and I was able to run all PhotogeoDWG features as expected. So, if you’re holding off on running tools available via Exchange apps because your expecting conflicts with Windows, there’s actually no need to wait. Just a quick note to announce that PhotoGeoDWG is now available on the Autodesk Exchange Apps Store. Leave a comment, tell us how to make it better. 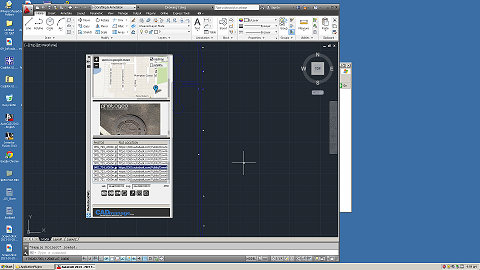 PhotoGeo will run in AutoCAD 2012/2013 and Civil3D 2012/2013. And, did I mention it’s free? Our CADmanage.com help page has a link to the PhotoGeoDWGhelp.pdf (right click on the link to download the file).